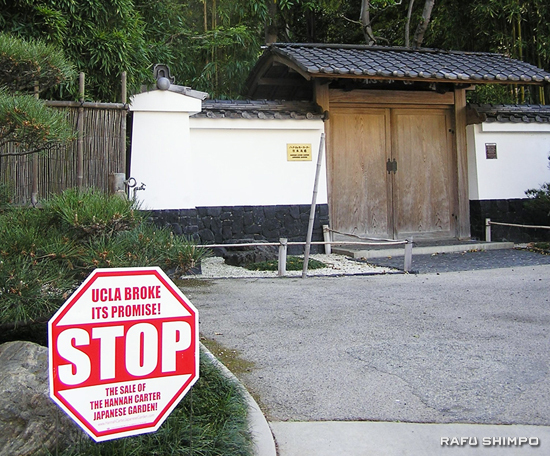 This past Sunday, neighbors and preservation-minded individuals who have been trying to block the sale of the UCLA Hannah Carter Japanese Garden in Bel Air were planning to attend an open house hosted by the realtor, but the event was canceled at the last minute. The person in charge at the UCLA was not available for a phone interview on Tuesday. The 1.5-acre Hannah Carter Japanese Garden is located on a hillside property with a two-story Western-style house on top of the hill. According to the Realtor’s website, the listing price for the garden is $5.7 million and the house is listed at $9 million. The house is 7,266 square feet with three bedrooms, a two bedroom-guest house, a fireplace, a pool and a pavilion. The bidding process will be closed in May. Garden supporters hosted a public meeting in February to voice their concerns to UCLA, and nearly 100 people gathered. The group created a website (www.hannahcarterjapanesegarden.com/) and has collected over 1,500 signatures on petitions requesting that Chancellor Gene Block and the UC Board of Regents save the garden. However, plans for the sale have not changed. The group has also been writing letters to Block, UCLA and the Realtor to address their concerns. Campus officials estimate the sale of the property would generate adequate revenues to establish the approximately $4.2 million in endowments and professorships identified by the Carter estate to benefit UCLA’s academic mission. Among them are professorships in business administration at the UCLA Anderson School of Management and in internal medicine at the David Geffen School of Medicine at UCLA; a professorship and a research center in 17th-century European art; and funding for use at the discretion of the director of UCLA’s Jules Stein Eye Institute. Any additional money generated by the sale would be utilized to help fund campus priorities at the discretion of the chancellor, campus officials said. The sale of the garden and home is part of a larger effort by UCLA to sell underutilized properties to generate revenue for core educational programs and the public mission of the university. The garden was designed by revered Japanese garden designer Nagao Sakurai in 1959, and was constructed between 1959 and 1961. It was obtained by the University of California in 1964, through a gift by Edward W. Carter, chair of the Board of Regents. Through an agreement with Carter in 1982, it was renamed in honor of his wife, Hannah. At the same time Carter made known his desire that the university establish a $500,000 endowment from the proceeds of the sale of the house — which he also donated to UCLA — to maintain the garden indefinitely. In 1969, extensive flooding resulted in a mudslide that damaged the garden. Koichi Kawana, a UCLA professor and a pioneer in the design of traditional Japanese gardens utilizing an area’s native plant material, rehabilitated the garden. The renovation was funded by the Friends of the UCLA Gardens. Garden supporters claim that the1982 agreement stipulated that the garden be maintained in perpetuity and never be sold. However, after legally amending the agreement in 2010 to remove the “in perpetuity” clause (unbeknownst to the Carter family), UCLA listed the garden and the adjoining home for sale on March 3, following the January removal of “valuable art objects that are integral to the design of the garden,” according to the Coalition to Save the Hannah Carter Japanese Garden’s website. Supporting groups include the Bel Air Beverly Crest Neighborhood Council, the Garden Conservancy, the Los Angeles Conservancy, the California Preservation Foundation, the California Garden and Landscape History Society, the Cultural Landscape Foundation, the National Trust for Historic Preservation, the North American Japanese Garden Association, the American Public Gardens Association, and the American Society of Landscape Architects. Thank you for your continuing interest in one of the premier Japanese Gardens in the nation. It is important to note the sale of the adjacent family home will provide money for ALL the intended professorships PLUS a generous endowment for the perpetual care of the garden PLUS additional funds to be used for any purpose at UCLA. Please let Chancellor Block and the UC Regents know that the sale and potential destruction of this Los Angeles treasure is unacceptable beyond words. It is unbelievable that the university is unwilling to sit down with the coalition to discuss a “win/win” solution, which would be for them to continue ownership but be relieved of the cost of maintaining and operating the garden as a public treasure. The sale of the garden would net them 1/20th of 1% of their annual budget. How sad that neither the university board of regents or the courts would uphold the generous gift of the Carter Family, in honor of Mrs. Carter. It is clear that the support of the gardens was well planned; that is not the problem……..greed is! It is a national treasure, second to none. I live in MO and have visited the gardens and was looking forward to another visit this week when I found this information on the web site. This is criminal! I have written letters to all of the Board of Regents and signed the petition and encourage others to do the same. So much for charitable gifting. The freedom of information act should be applied to see who the buyers are for the property. Who owns the Bel air Hotel?